It's not a revelation that mobile games are often lazy and exploitative. There are exceptions, of course, but the pay-not-to-wait and pay-to-win are the most popular monetization methods used by mobile developers. However, with Diablo Immortal and Harry Potter: Wizards Unite expected to hit the Play store soon, let's look at two current mobile games based on nostalgic franchises as case studies and see what tactics they use to lure us in. Does Blizzard deserve Hell for Diablo Immortal? Although we are late in covering this game, Harry Potter: Hogwarts Mystery is so egregious in what it does, it needs to be used as an example. 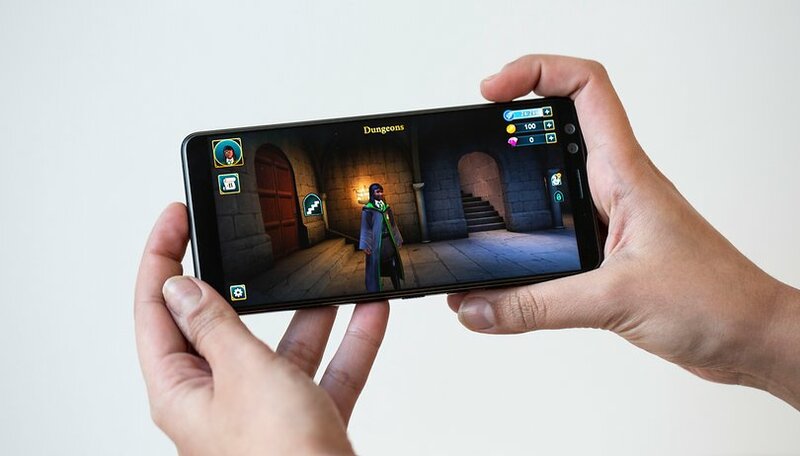 Developed by Jam City, under license from Portkey Games, this mobile game's story takes place in the Harry Potter universe, but before the events of the Harry Potter novels. At first glance the premise seems intriguing - you play as a 1st year witch or wizard, whose brother has gone missing. It is your task not only to take Charms and Potions classes, but to uncover what happened to him. You see many familiar faces along the way - Professors Dumbledore, Snape, McGonagall, Sprout and Flitwick. Of course, Hagrid is there too. The film actors have reprised their roles and voice the in-game characters (with the exception of Alan Rickman), which is probably the best thing about the game. However, that combined with the use of the Hedwig theme from the Harry Potter and the Sorcerer's Stone film, is just nostalgic bait. It's there to lull you into a false sense of pleasant familiarity, covering up the cash-grab nature of the Hogwarts Mystery. What do you actually do in this game? You tap things. That's pretty much it. There are dialogue 'mini games' (if they even deserve to be called that), in which you can choose between three options. Occasionally, you can drag your finger along the screen, imitating the movement required to perform it with a wand. The problem is that energy is required for every action in the game and it's a limited resource. When used up, you can either wait for hours for it to refill or buy some with in-game currency (gems). This is combined with timers for tasks, meaning that if you miss your window after waiting for an energy refill, you have to play the waiting game all over again (pun intended). The other in-game currency is gold coins, which are mostly used for cosmetic purchases and need to be bought with real money, when you don't earn enough from tasks. It wouldn't be so bad, if the game didn't try to leave you on cliff hangers constantly, destroying any immersion. The story might be compelling, but most wouldn't know unless they're willingly to shell out exorbitant amounts of money. I'm fine with microtransactions as long as they're limited to cosmetic items only. As a long-time Harry Potter fan, it doesn't seem like it's worth the time or money anyway. I mean is it really that hard to consider naming your in-game currency galleons, sickles or something that is actually relevant to the universe's lore? It also would have been incredibly easy to just include the existing sorting quiz created for Pottermore by J.K. Rowling herself - instead this game simply lets you choose what house you'd like to be sorted in. If you pick Slytherin as your house, you're also in for a surprise - Snape acts out of character constantly. As a mystery game, it also would have been a no-brainer to include more riddles and puzzles. After all, we see many of them in the books and in the films - the potion riddle used for protecting the Sorcerer's stone, for example. Yet, despite agreeing with a lot of my points, many reviewers on the Google Play Store still give the game a good rating - Hogwarts Mystery maintains around 4 stars (with over 10 million downloads). I find this baffling - just because it's technically part of the Harry Potter universe doesn't mean you should give the game a free pass. And besides, J.K. Rowling won't be personally offended that you didn't like a game she didn't write or develop. Overall, Hogwarts Mystery is a blatant example of a nostalgic cash-grab. You'd think that with a name like Harry Potter attached to it, they can follow the cosmetic purchases only models of games such as Fortnite and DOTA 2. Instead all of the passion for the franchise has been squeezed out of it, leaving an empty, microtransaction-riddled husk behind. Let's hope Niantic's Wizards Unite actually does better. While Hogwarts Mystery doesn't take too long to reveal its true colors, Konami were playing the long-con with their mobile version of the ever popular Yu-Gi-Oh! trading card game. When it first came out, Duel Links had made some changes to the game to make playing on mobile easier. Fewer monster card and trap slots, but the core mechanics remained pretty much the same. Cards and characters from different versions of the franchise (Duel Monsters, GX and now 5Ds) were added consistently through interesting events. Cards could be unlocked in a variety of ways - through leveling up characters, dueling against NPCs or opening packs from themed card boxes. Each pack costs 50 gems - the Duel Links in-game currency. This is where the trouble starts, however. In the beginning, gems were easily obtainable through events, missions and leveling-up characters. Now, the rewards are slowly being taken away or lowered, in an effort to incentivize players to spend more money. If you are into Yu-Gi-Oh! and card games, in general, you know that opening card packs is always a gamble - in the literal and figurative sense. That's why spending inordinate amounts of real money is risky and often doesn't produce the desired results. Konami has also locked many useful and highly-desired cards behind a paywall in a clever way. Ultra rare cards, for example, only have 1 copy per box. If you are unlucky, you might have to open 180 packs (50 gems per pack) until you get what you need - using up all your gems or spending your rent money on virtual cards. For some decks to be effective you also require 3 copies of an ultra rare card, meaning you need to reset the box and spend even more currency. As a competitive game with a ranked mode, this means that paying players have a huge advantage over free-to-play gamers. This gap will keep growing, as sources of free in-game currency are slowly being phased out. Many players were displeased with Konami's decision and even started a hashtag #iwantmygems, but that did not change the company's mind. Yet, in the long-term, I've already seen the game lose a huge portion of its playerbase and it will continue to do so. So-called 'whales' - users who pay to win and spend great sums of money doing so, will drive out those without resources. It's pointless to play a rigged game. After this, whales would have no one to stomp. Maybe few will stay and play with each other, but I think it will ultimately doom a game with great potential to an untimely death. With Blizzard announcing Diablo Immortal - a mobile version of one of their most beloved games, it is not unthinkable that many big PC publishers and developers will start to expand or move to mobile. The game is expected to have the same monetization methods as many other mobile games. The news was met with enormous amounts of backlash already, but that has only made Blizzard double down. No wonder - last year the company made over 4 billion dollars in revenue from microtransactions. It's a successful business model, which is why you should expect it to sneak onto your gaming platform of choice. Lootboxes and cosmetic purchases have been part of triple A PC and console titles for a while, for example. Why is this bad for gaming in general? Because as you have seen from the above examples - many developers and publishers are satisfied with low quality content, as long as it makes them money. Currently, if attached to a big nostalgic franchise, they rely on the low expectations of many mobile gamers to keep them afloat until the backlash is over. Most worryingly, however, these games literally exploit a small addicted percentage of their playerbase, who are responsible for the vast majority of in-game purchases. A lot of developers are not only fine with that, they encourage it - this is why buying things is as far removed from real currency as possible - money used to buy coins, coins used to buy gems, etc. It makes it harder to keep track of how much money you're actually spending and what the exchange rate between real and in-game currency is. What can we do? Take off the rose-colored nostalgia glasses and see some of these games for what they really are - lazy cash grabs. Besides, I think it would be a shame for kids to grow up with these unimaginative apps and have them turn into their nostalgic experiences. So, give these mobile games a terrible review when they deserve one and support titles created with passion and effort, if you don't want to see your favorite game studio go bankrupt like Telltale. What do you think? Have you fallen for one of those nostalgic traps before? Let us know in the comments below. I think the last video game I played at any length was the "Doom" series. I stopped at Doom 3...when it got to the point, where I'd come home, eat, sit down for "just an hour" then look at the clock and it was 11pm, I just stopped...wasn't worth it. I think the advice about being willing to give a terrible rating when it is deserved is solid and I wish more people followed it. Unfortunately, the developers are smart enough to get you to review in the first hour of playing when it still has the "new and shiny" appeal, and most people are too lazy to go back a week or a month later to give an honest opinion. Luckily the people who write reviews rather than just click stars often take the time to be insightful. These kinds of games hold no interest for me. Well, Pokemon Go is a very popular game but also one that capitalizes on nostalgia. Niantic actually put effort into what they made - that's the difference. Even if they stumbled in the beginning. So I think everyone can fall into the trap, if it's a game based on a franchise near and dear to their heart. Especially if companies play the long con like Konami did with Duel Links. I'm not ashamed to say I fell for it. I prefer gaming on PC, but Duel Links seemed like a fun, free-to-play game when it came out. Then in the course of 2 years the free sources of in-game currency dried out and the game became a boring grind. I also think the use of microtransactions and pay-to-win models will only increase in the future, so it will affect anyone who plays games on any platform (unless you're playing retro games on the original consoles). Got caught with Need for speed world and their pay to win model. Needles to say haven't supported EA since. Although I purchase SC2's war chests at least you get the skins you can enjoy afterwards. Maam in today's date where can we get retro games with the original consoles? Flea markets or ebay (expect them to be overpriced though). There's always PC emulators, of course, but not all of those are legal.